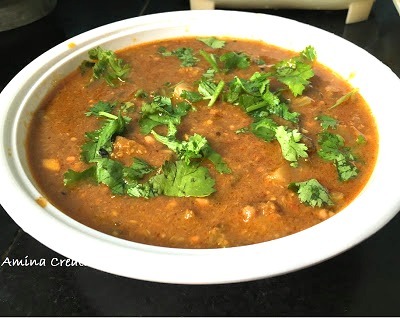 Puli kulambu or tamarind curry is a tangy and delicious curry that is commonly prepared in most South Indian homes. It is ideally served with rice but also goes well with chapathi. Wash and soak the tamarind in water for atleast 10 minutes. Extract the pulp and keep ready. Heat 4 tbsp oil in a non stick pan and stir fry the brinjals and ladies finger till they turn soft. To the same pan, add mustard seeds, curry leaves, urad dal and chana dal and sauté for a few seconds. Add potatoes and salt and stir fry for a minute. Add 1 cup tamarind pulp and bring to a boil. Continue cooking for 10 to 15 minutes till the potatoes are cooked. While the potatoes are getting cooked, heat 2 tbsp oil in another pan and add onions. Saute till they turn golden. Next add coconut paste and mix well. Cook for a couple of minutes and switch off the gas. Allow the mix to cool down completely and grind to a paste. Add this paste along with the fried brinjals and ladies finger to the potato mix and mix well. Add the remaining tamarind pulp and water and bring to a boil. Continue cooking for 5 more minutes and switch off the gas.